Color detection sensors embraces advanced sensors which apart from distinguishing light produced by the target, also helps in recognizing various colors of the light. For the detection of temperature, brightness and RGB components of ambient light in smartphones, color detection sensors are used. Phones adjust the brightness of the display and backlight for a clear viewing experience. The government is investing in research and development activities and to upgrade technologies in medicine, industrial, food and health and biotechnology. With the increasing need to improve drug safety and efficacy in the drug development will impact the growth of the market in the forecast period. Goldstein Research analyst forecast the color detection sensors market size is set to reach USD 3.64 billion by 2024, at a CAGR of 6.50% over the forecast years. The color detection sensors vendors are offering customization, easy-to-use and portability of the product as well as streamlining of the product. 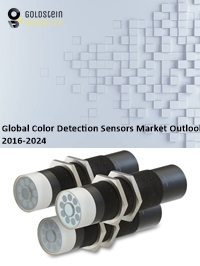 The report covers the present ground scenario and the future growth prospects of the color detection sensors market for 2016-2024 along with the new product launches, collaborations, and acquisitions by the market players. We calculated the market size and revenue share on the basis of revenue generated from major players across the globe. On the basis of product type, color sensing sensors held the highest market share of 48.0% in 2016 due to its wide application in various industries such as electronics, food and beverage, and pharmaceuticals. Color sensing sensors are used in smartphones and tablets as to control the brightness according to the ambient atmosphere. Whereas, on the other hand the market share of RGB sensors is growing steadily at a rate of 6.23% owing to the demand of ambient light for image tuning and automatic backlight dimming. Global color detection sensors market outlook 2016-2024, has been prepared based on an in-depth market analysis from industry experts. The report covers the competitive landscape and current position of major players in the global color detection sensors market. The report also includes porter’s five force model, SWOT analysis, company profiling, business strategies of market players and their business models. Global Color Detection Sensors market report also recognizes value chain analysis to understand the cost differentiation to provide competitive advantage to the existing and new entry players. Our global Color Detection Sensors market report comprises of the following companies as the key players: SICK AG, Banner Engineering Corp., SensoPart Industriesensorik GmbH and Rockwell Automation, Inc.
Other high-flying vendors in the market are: Ifm electronic gmbh, Hamamatsu photonics K.K., Pepperl+Fuchs GmbH, Omron Corporation and Keyence Corporation. According to the report, major driving factor for color detection sensors market is the increasing usage of color sensors in smartphones. Tablets, smartphones and other display-equipped devices integrate color sensors to analyze the RGB components of ambient light for display image adjustment or to perform backlight dimming that can be adjusted according to the surroundings. There is a growth in color detection market with the increase in smartphone manufacturing. Further, the report states the major challenge is that these sensors are inaccurate i.e. sometimes they are not able to differentiate between almost similar shades of the colors so in these cases the companies are opting for manual processes. In addition, the small scale companies are able to adopt the color sensors due to its high implementation and maintenance cost. Based on geography, Europe dominated the global color detection sensors market with the market share of 39.2% in 2016 due to rise in the textile and automotive industries. Color detection sensors market in Europe is estimated to reach the valuation of USD 600 million by 2021 as many apparel brands such as Louis Vuitton, Dolce and Gabbana, Jimmy Choo etc. creates the demand for textile machinery integrated with color detection sensors. On the other hand, Asia-Pacific is growing steadily with a CAGR of 8.0% owing to the increasing demands from industries such as oil & gas, healthcare industries and waste water treatment. Whereas, North America is an opportunistic market with a market share of 20.1% in 2016 owing to the increase investment in the research and development activities. What is the revenue of color detection sensors market in 2015-16 and what would be the expected demand over the forecast period?